Saturday, May 23rd in Washington, DC at U Street Music Hall EMPIRES are opening for Geographer. 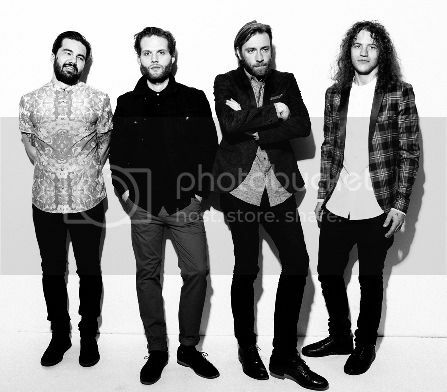 I had the opportunity to ask EMPIRES guitarist Tom Conrad a few question and here’s what he had to say. Rock N Roll Experience: Describe Empires in 5 words or less. Tom Conrad: Like riding a bronco. Rock N Roll Experience: Where do you call home? Rock N Roll Experience: How long will your current tour keep you on the road? Rock N Roll Experience: Do you have any big plans for a Summer tour? Tom Conrad: Festivals and more sweaty clubs. Rock N Roll Experience: Do you relate more to the current music scene or the older scene? Tom Conrad: Older. Like the baby boomers. Rock N Roll Experience: What can fans expect for the DC show this Saturday? Tom Conrad: Bring a towel. Rock N Roll Experience: As an opening act on this tour have you experienced any crowds that didn't like your material? Tom Conrad: Yes, Chicago. Total stiff city. Rock N Roll Experience: What's on the horizon for Empires?